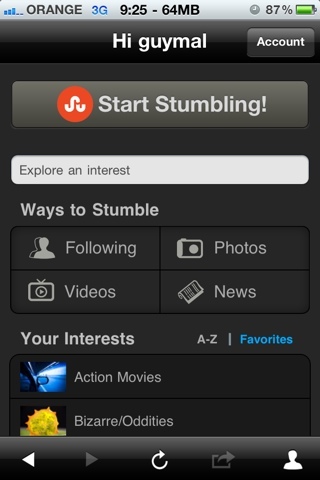 The StumbleUpon website has been around for a long time now and their iPhone app is a natural extension of the basic service. If you're not familiar with Stumble Upon it's a simple service that let's you discover new websites based on your personal preferences and interests. All you do is hit the stumble button and you get a random site. If you like what you got you click on thumbs up, or give it a thumbs down if it's not to your liking. The more you stumble the more the service learns about your taste and improves the results it gives you. This experience works well on a mobile device since you can just launch the app and discover new stuff whenever you have a few minutes to spare. The StumbleUpon iPhone app does pretty much the same as the website and can be quite enjoyable in those situations where you pull out your phone and just want to find something new and interesting. It's a universal app that works on both the iPad and iPhone.